As we enter the season of Fall many of us are excited to be starting new Bible studies! So, let’s stop and think for a moment about our motivation. What is the purpose of Bible study? Choosing to study the Bible is obviously a wise use of your time. You might describe this activity as having eternal value and it’s worth truly priceless. However, we must always keep in mind the true purpose of studying the scriptures. For those of us who enjoy the process of study, there is the danger of becoming consumed with the study itself. Take a look a what Jesus said in John 5:39-40. Why do you study the Bible? Surround your study time with prayer and make sure your motive is all about Jesus! August is rushing by and we will soon find ourselves flipping a page on the calendar. Back to school, cooler weather, scarves, jackets… September is also time for new Bible studies. There are many groups, local and online offering Bible studies beginning at the end of August or within the first two weeks of September. Now is the time to research what is available and make a choice so that you’ll be ready. Be sure to ask God what study He has planned for you to join. Don’t just ask but listen for the answer. Pray about it now and then begin exploring the options. In the course of your research, you will likely come to realize the particular study God is directing you toward. We have an abundance of Bible study choices today. The search can become an overwhelming task. That’s why I’m providing a listing in this post of online Bible study groups. Follow the links for all details. 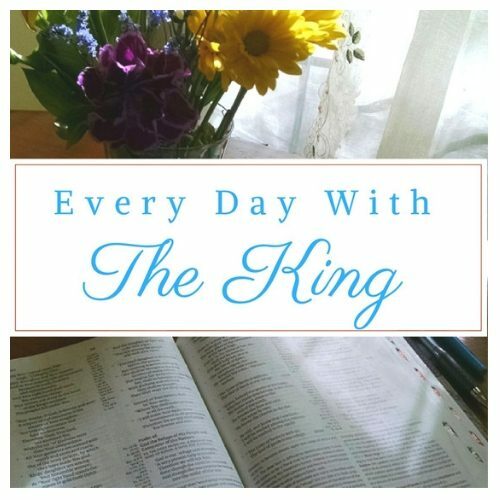 You will also find more about Bible study options on the Every Day with the King Facebook page. Join in at any time of the year! Learn all about it at the website. Do you know of a great study group that I’ve not included? You are welcome to share in the comments below. What study are you planning to do? If Jesus Christ is your Lord and Savior, you are living daily in His presence. You are never alone because He is always with you. Do you live like this is true? As I said in the blog post, Constant Prayer, one of the marvelous things about a relationship with Jesus is that He is constantly present. Our problem is forgetting He is there! We forget because we cannot SEE! There is so much for us to drink in from the above passage of scripture. Please take the time to explore it beyond a quick read. Don’t do it alone. Ask Jesus to reveal Himself through the Word and make you aware of His presence there with you. The Living Word and the written Word are meant to go together. I don’t want to settle for being awake. I want to live awake and aware! Are you interested in practical steps to help live in the awareness? Sign up to follow the blog. Also, follow on Facebook for even more. If you missed it, please take a quick moment to read the last post, Constant Prayer. That post was basically an introduction to the subject of living in the awareness of Jesus being actually present with you. You might call it God-awareness or the practice of the presence or something else but regardless of what you call this lifestyle, it is key to the abiding life with Christ. I plan to publish a post soon on practical steps to help with living in the awareness. But today I want to share a little about one of the results of this style of living. Living aware causes reading the Bible to be completely different. When you know you are with Jesus, who is the Living Word and you explore the written Word together, He will open your eyes to see! Living aware leads to times of Bible reading/study becoming a breath taking experience. There are times that I feel like I’ve been transported into a treasure room through a scripture passage. Wow, does anybody else know what I am describing? This scene from National Treasure is something like the feeling I am talking about. Exciting, adventure, mystery, treasure, this is what happens when you go with Jesus! The above portion of Scripture contains the last words Jesus spoke before He returned to heaven. So much is packed into a few precious words. Jesus was leaving and the Holy Spirit was about to arrive. It was almost time for the followers of Jesus to become His witnesses. In the next chapter of Acts, we read the account of the Holy Spirit’s entrance. It is good to read the account and study Acts but are we living it? We long for Jesus to return. He is not with us physically at this time but we have the Holy Spirit. We need to stay focused on being witnesses of Jesus. The ability and the power to accomplish this quest is through the Holy Spirit. We have a mission of the highest honor. As Pentecost approaches this year, spend some prayerful time dwelling on what the Holy Spirit will empower you to do if you are willing. Take Acts 1:8 to heart. Ponder, pray and respond. Yes, there is much darkness all around us but we have the light! How awful to be keeping it to ourselves instead of sharing. Let us serve with joy and love. Watch this short, powerful clip from Priscilla Shirer as she appeared in the Anointed, Transformed, Redeemed A Study of David. Let our song join the one that never ends! What is your process for selecting Bible studies? Do you tend to select books and studies from your favorite authors? I think most of us do. It is easy and safe to choose a study from a writer you know and like. I tend to do this often but sometimes I think this pattern may cause us to miss out. When I have ventured out and selected a study from someone unfamiliar to me, it has often turned out to be a great Bible study experience. So I challenge you to give it a try. Be adventurous in your selection. Be open to where God is leading you. Researching online and reading reviews can be very helpful. I love to have the opportunity to hear directly from the author about any book or study I’m considering. That’s why I am excited about Friday, March 31st. That is the day of the 2017 Bible Study Expo! Marnie Swedberg is the hostess of the Bible Study Expo! This is an opportunity to hear Marnie Swedberg interview 12 different authors all in one afternoon. Here are the scheduled authors including links to their websites. This only happens once a year. Last year’s event was fantastic. Make sure you don’t miss it. Have suggestions or comments about selecting books and Bible studies? Please share in the comments below. I would love to hear from you. What do you do when trouble knocks on your door? There is no doubt that difficulties will come into your life. What is important is how you choose to respond. Would you like to be prepared in advance? Please read the following chapter from 2 Chronicles for a great plan. This chapter contains a powerful formula, that if followed today, will produce the same results that it did for Jehoshaphat, so long ago. This chapter shows us the steps to conquer problems, and enable us to live in victory with joy! Note: To respond as Jehoshaphat did, we need to be choosing to spend time alone with God on a daily basis. Walking and talking with the King needs to be our way of life. These are steps that I found while studying the chapter. I remind myself of them when difficulties come my way. I pray that you will find it helpful also. I am very certain that you will discover more treasure in the chapter if you study and pray to see. Please take a moment to comment below. I would love to read what God shows you. As I thought and prayed about writing a Christmas devotion, I felt God wanted me to focus on the shepherds. Following the shepherds leads to a joyful challenge. It seems that often the shepherds are overlooked. Maybe because they don’t seem as interesting as the wise men who followed the star. We picture the wise men in royal robes surrounded in mystery. The shepherds were uneducated men of low status. They would certainly not stand out in a crowd. These ordinary shepherds bring to mind a lowly shepherd boy by the name of David. He was not special in appearance but God selected him to become King. But more importantly, the shepherds remind us that Jesus is the Great Shepherd who will be returning as King of kings and Lord of lords. As far as we know these shepherds were not looking for or expecting anything out of the ordinary on that night, as they were caring for their flocks. But, their lives were forever changed in a moment, when their eyes moved from watching sleeping sheep to seeing and hearing angels! As soon as the angels leave, the shepherds go without delay to find Jesus. We don’t know what they said or how they reacted when they saw newborn baby Jesus lying in a manger. I am guessing that they knelt in silent worship. Next, they begin telling everybody. Then they go back to work. This amazing beyond description experience has just been theirs but yet they have to return to the same old life. What is different is inside of them. They return to work but they are glorifying and praising God! The shepherds have left us with a great plan to follow. I want to be like them. I love Standard, or what I call real-time. To me, setting our clocks back one hour each Fall is cause for celebration. Do you know why we skip ahead an hour each Spring? Daylight Saving Time is to allow longer evening daylight in the summer, by setting clocks one hour ahead of Standard time. Well, enough about Standard vs Daylight Saving time. The true purpose of this post is not to share my happiness over the return of the hour but to focus on the gift this hour brings. The gift is CHOICE. You get one more hour of time to use whatever way you want. You may decide on an extra hour of sleep or an extra hour of anything else. It’s your choice to spend your hour any way you desire. You are used to getting up at a certain time each morning, right? I have a suggestion for those who have difficulty finding time for a morning quiet time with God. You could set your clock back the hour to Standard time but set your alarm for one hour earlier. You would continue to rise in the morning the same as you have been. You will be ready to sleep earlier at night so you adjust your schedule by going to bed an hour earlier. If you choose this way to spend your extra hour then you need to plan ahead and make it happen. On Sunday night set your clocks back the hour. Set your alarm ahead one hour. If one hour is too much then try 1/2 hour. Pray about it and make your plan. What will you do with your hour? Please leave your answer in the comments below.